October is the perfect time of year to start thinking about updating your home! Its the perfect time of the year to bookmark all the pieces you want and pick them up online / instore when the sales start just before or after Christmas in the new year sales, you could be saving loads. So for now I would suggest for you to ignore all those 10-15% off deals because you can be sure everything will be even cheaper in the new year sales. My favourite places for home pieces are Zara Home, The White Company, Debenhams, TKMaxx and John Lewis. I will start browsing end of this month and share with you my key picks! Where do you like to shop for your home pieces? Look forward to seeing all your picks!! 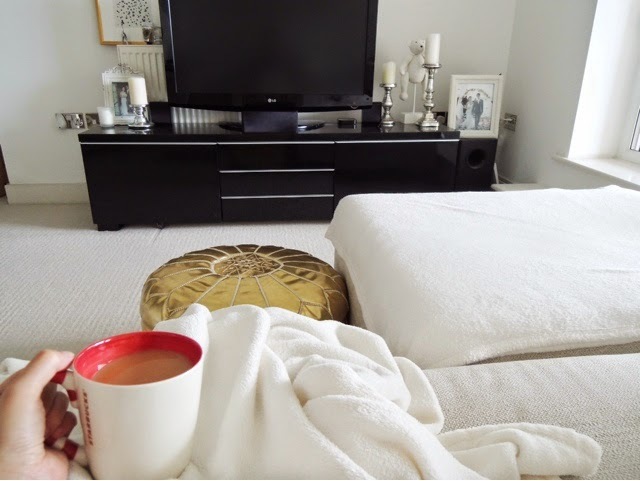 I'm loving H&M home, ikea & notonthehighstreet currently! I had a browse in JL today and there are so many nice things in there! I will take a look at IKEA before xmas so I can gather my list together! Thanks...I am afraid I have already done one a while back. Thank you Kerry! Iam still trying to add personal touches to it but yup I love minimal! Your home is simple but really makes a statement. I love your drawers with the wicker baskets !! Where are they from :) ? 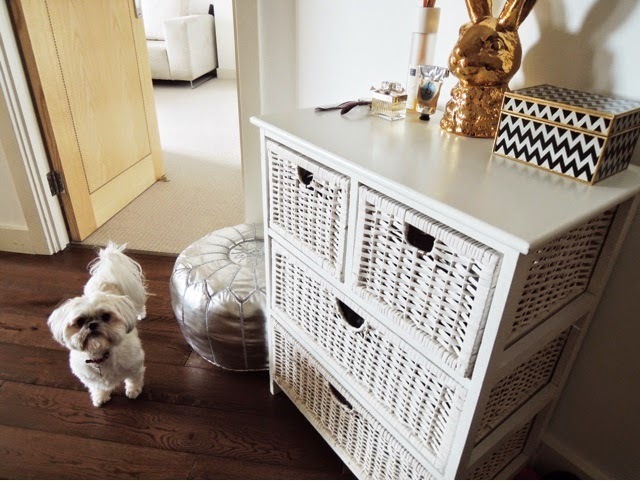 ahh I brought the draws / wicker baskets a few years back from TKMaxx...it was one of those one off items I am afraid. Thanks for stopping by Jamie! The poufs are so cute. 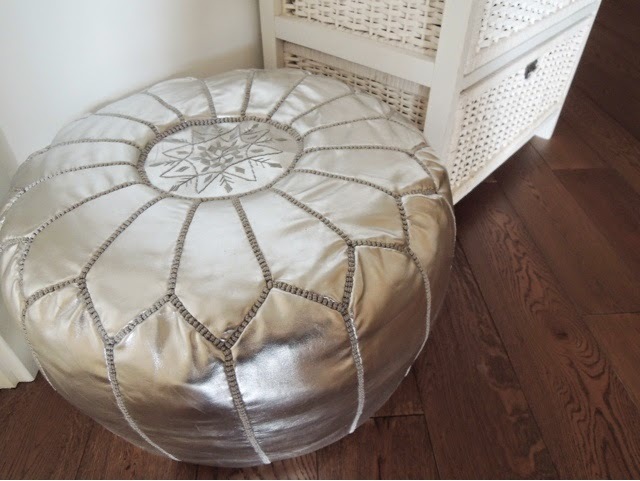 The metallics really punch up your space! 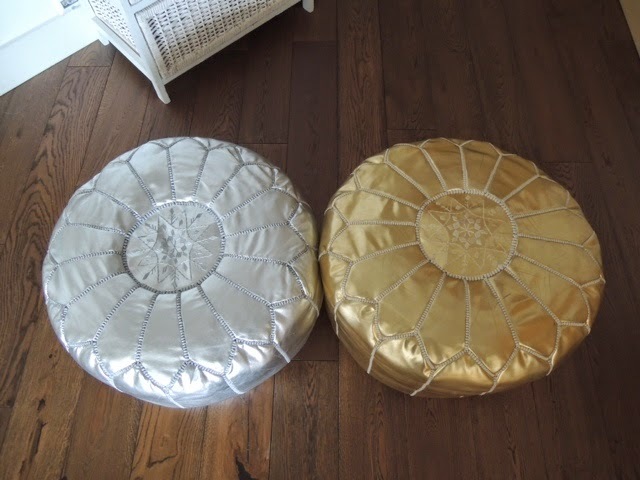 I love these pouffes! They come in so many colours but gold and silver are definitely for me! I looooove the minimalist theme you've got going on. TK maxx is definitely my go-to place for home interiors, so many hidden gems! Sooo many great finds in tkmaxx if you take the time to go through everything! Some times it can be hit / miss but most of the time I find great items for my home at such cheap price! Oh my god how cute is your dog! I absolutely love the clean, modern feel of this room, I love the black glossy TV table, and the metallic footrests add a little bit of bling and character. Such a lovely room! Thanks Sam. Yes she's a cheeky one my Tula! Thanks for stopping by! I AGREE with JL being a dangerous place! I love that golden rabbit on your drawer unit! It reminds me so much of Alice in Wonderland, such a lovely house! I wish my flat was this tidy. Hopefully when I move it will be. I love Next and George for home accessories! I have a similar post scheduled for wednesday to this! Great minds! It's not always this tidy! It actually gets messy as the days go on, only do a tidy up once a week! I also love TK maxx for home things, so reasonable and such cute things. Stayed tuned for my next home update Betty!! !